This website is dedicated to exploring the bigger picture of ideas. Our mission is to put content on this site that focuses on a variety of ideas, cultures, and philosophies. Every year there is a mad rush of students filling out the requisite university admission forms, writing the Statement of Purpose letters and then waiting and praying for their application to be accepted by the premier institution they've set their hearts on. Thousands apply to the Ivy League colleges but every year only a fraction of those who applied manage to make it. Harvard University has thousands of applicants each year, of which a majority don't make it through the selection process. Out of the 39,506 applicants for the undergraduate class of 2021, only 2,037 made it into its hallowed environs, and no one on the waitlist made it. For Richard Jenkins who did make it to the coveted acceptance list, it is a 'fairy tale’ ending of sorts. For someone who spent his early years between motel rooms, hospitals and homeless shelters earning a spot at Harvard was no easy feat. It's not as if a fairy godmother waved her wand and made it all right, Richard actually worked really hard to get to where he is today. He was so driven towards academics in grade school that it eventually earned him the honor of becoming the valedictorian of his high school and it was only logical that his next step would be into one of the Ivy Leagues. “That's when I realized I've got to buckle in, because I can't have my potential kids going through what I'm going through now,” he said. His determination to change his circumstances made him push himself even harder. In middle school, he joined Mighty Writers an after-school program that helped him hone his writing skills. The program also helped him with the application process for joining an elite high school. The pressure sometimes got to him and it was a very difficult phase in his life. “There was a lot of pressure to get into high school and succeed. And then my dad had a heart attack.” Recalls Jenkins. He also began to suffer from severe migraines at the time for which he spent significant time in the hospital. Jenkins did not give up and stayed on track to pursue his goal. His hard work did not go in vain and he was accepted with a full scholarship into Girard College, a boarding school for students with single parents having financial constraints. He earned straight As at college and was later named his class valedictorian. During his time at college, he also interned with a tech startup. In his last year at college, he sent out applications to many schools including three Ivy League colleges. Harvard accepted his application, much to his disbelief, but he was rejected by Yale and was on the waitlist at the University of Pennsylvania. Jenkins was ecstatic that he did not have worry about the exorbitant fee as students from households that earn less than $65,000 a year receive 100 percent funding for the tuition fees from Harvard. To help with the rest of the expenses his godfather created a gofundme page. Jenkins took it for granted that this goal of his would land him in a smaller school. At Harvard, his plan is to major in Computer Science. 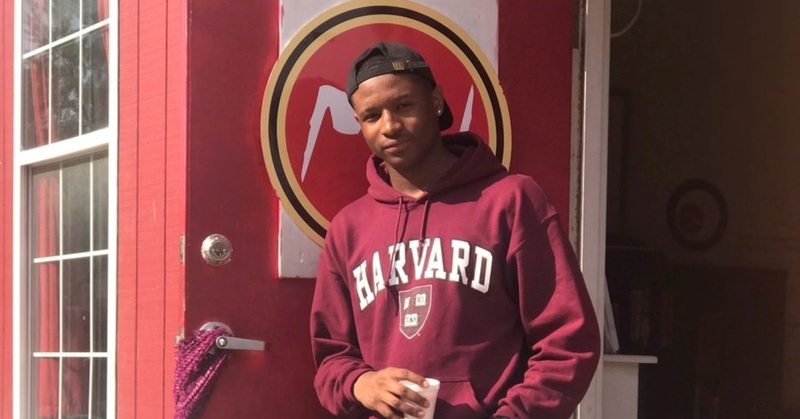 He says that he is most excited about the opportunity to expand his knowledge given the rich history of Harvard and the diversity of its students. “I think it’s a perfect place to cultivate a mind.” He says. Jenkins spoke at his high school graduation about how important responsibility was. "My drive comes from just wanting to see myself and my family be in a better situation and I do think drive is important for everybody, but what's more important is that once you find what it is that you want, you have to keep working for it," he says. "People may think that they've done enough, but it's never enough." Figure out what you want in life, focus and never give up, is his advice to other students.